Australia’s booming renewable and storage industry has blown away previous records, with new data showing investment in the renewable projects sector reaching $20 billion in 2018. There are a staggering 83 renewable projects currently in construction (or due to start construction soon) across Australia. It’s the value of these committed projects which have delivered the investment bonanza, according to the Clean Energy Council. In addition, the CEC forecasts a surge in renewable sector employment. It says the record investment will deliver over 13,000 direct jobs in building, maintenance and operations. 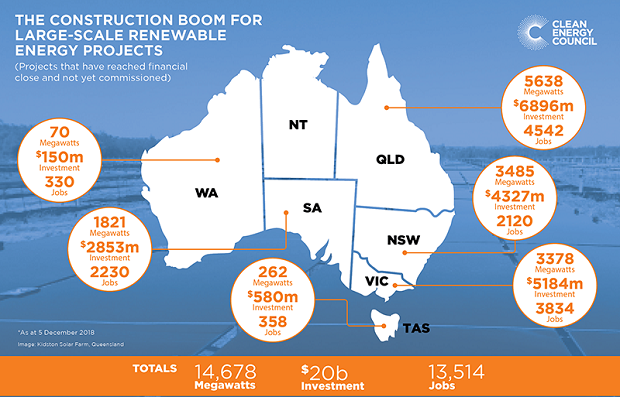 Record 2018: Australia’s $20 billion boom in renewable investment by state. Image: CEC. Overall, 14.6 gigawatts (GW) of new wind and solar energy projects are under construction across the nation. Two million homes now have rooftop solar power. Add to that the total of completed renewable projects in 2018 and the investment picture is even rosier. “2018 was unquestionably a record year for the industry,” said CEC chief Kane Thornton. State policies, plus incentives provided under the national Renewable Energy Target (RET), has allowed new projects to be funded and built more efficiently than ever. And as solar and wind farms pop up far from city centres, regional communities are getting new opportunities in solar and wind farming. But the good news comes with a warning on energy policy. Thornton said the billion-dollar economic boom from renewable projects and storage technology could falter without an end to the climate wars. He pointed out that private investment in projects no longer required government subsidies to be viable. But without a long-term energy policy, the unparalleled growth seen over the past decade could come to an end. “As the year closes, we are no closer to national, bipartisan energy and climate policy,” Thornton said. Click here to see a full list of projects underway across the nation.